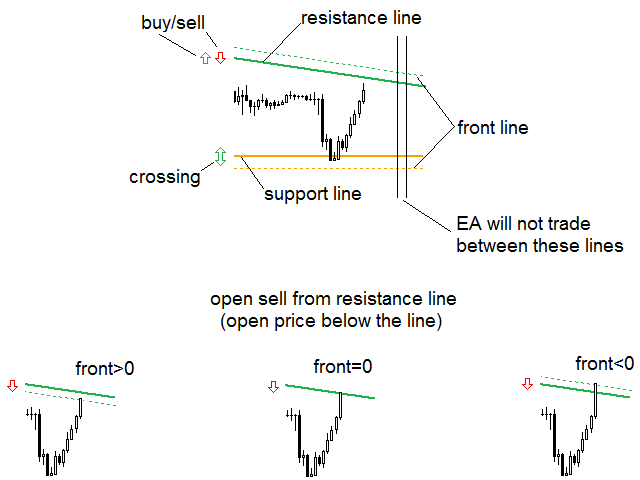 This EA trades support/resistance levels which were placed by a trader (Trend Line from toolbar). The direction of a trade is set graphically by arrows: ↑ - buy; ↓ - sell; ↕ - buy or sell in case of crossing support/resistance level. The level is off if inconsistent directions were set, like: ↑↓↕, ↑↕, or ↓↕. If the price is lower than a level it is a resistance level. And opposite is true for support level. write - manual level creation, all levels and their arrows are being saved, every minute (if there were changes), for farther offline strategy testing. read - reading levels and their arrows, which were saved before (new lines are checked every minute). Trader can use it in the Strategy Tester, or during online trading copying levels to another account. auto - two levels will be placed at the max/min bar open price of a selected timeframe within last week trade period. In this case arrows will be set as in auto_arrows parameter defined. nothing - manual levels will not be saved. The EA virtually trails stop loss. No-loss fixing regime is available. The EA reverses an open deal into the opposite direction deal if signal was received. If the trader sees that the price is moving within the channel or triangle, the EA will use the first line, set by the trader, to draw the second line of this figure. The EA could be disabled before the release of important news, in order to pass the fast price movements. The trader sets intervals of disabling in the form of paired vertical lines (this option is also available in the Strategy Tester). Pursuing the same aim the trader can set the limit to the price slippage specifying a slip parameter. EA does not interference into other trades. EA made a screenshot of a chart. sl - stop loss value in points >=0. tp - take profit value in points >=0. slip - allowed slippage in points when position is opening. print - interval of time for saving chart's (in minutes). magic - unique magic number of the EA's orders. front - the tolerance, in points, for the level`s touching. Could be negative (conservative trading, less deals), equal to zero or positive (aggressive trading, a lot of deals). breakeven - moving opened position to breakeven (with spread) if the price has moved to the take profit direction. In percent from tp. lot - lot size of a deal. sitting_losses - no-loss regime, on or off. 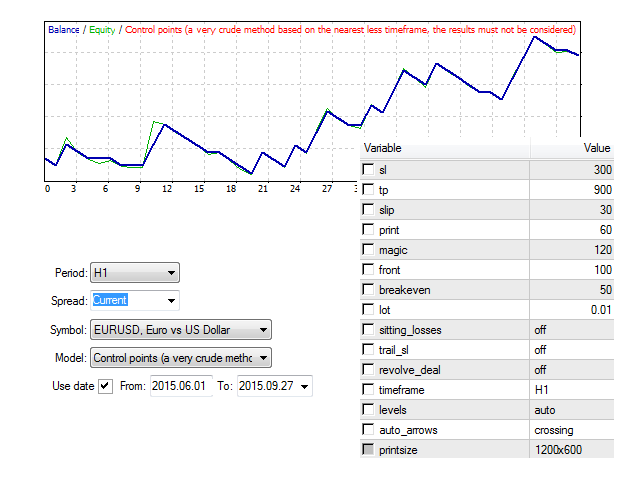 trail_sl - virtual trailing of a stop loss order, on or off. revolve_deal - revolving deal regime, on or off. levels - setting levels regime: write; read; auto; nothing (see description above). auto_arrows - trade direction in regime levels=auto. String value: up_n_down (↑↓ - buy from support level or sell from resistance level) or crossing (↕ - crossing sup/res level). printsize - size of a screenshot. After the deal was closed, the EA begins to check for the next signal when the new bar just appeared (of a selected timeframe). In the Strategy Tester trader can place levels (levels=write or levels=nothing), set arrows, what could be used for its own strategy development. The first part of a video instruction was made in a such way (timeframe - H1, control points). 1. The EA has been recompiled to the new Build. 2. The EA works in the Open prices only mode during testing and optimization. 3. Added Buy and Sell labels on the chart. When one of the labels is deleted manually, a deal in the opposite direction is opened. 1. The EA reverses an open deal into the opposite direction deal if signal is received. 2. Optimized offline testing capabilities. 1. In Free version lot size limitation is canceled now. 2. In addition to write levels ("w") and read levels ("r") regimes, automatic levels were added. They are set at maximum and minimum opened price of H1 bars of a last week trade period. Just set levels w/r/a/ parameter to "a". 3. Now, you cannot change parameters on a chart. Use F7 instead. 4. Writing or reading the levels, as well as their setting are accomplished every minute at 00 sec. 2. Now you can set the mode of reading or recording levels via the corresponding parameter - levels ("r" means reading, "w" means recording). Thus the EA launched on one account can read and draw levels of another expert launched on another account. It can be used for working with various strategies from same levels, using different stop loss, take profit trading modes (breakthrough/bounce). 1. Changed the principle of setting the trading mode when the line is crossed. Crossing level trading mode now is sett only by the double arrow - ↕. 2. Switching line off principle is changed. Line is switched off if incompatible trade modes were set - ↕↓↑, ↕↑ or ↕↓. Up arrow and down arrow mean bounce from the line. 3. 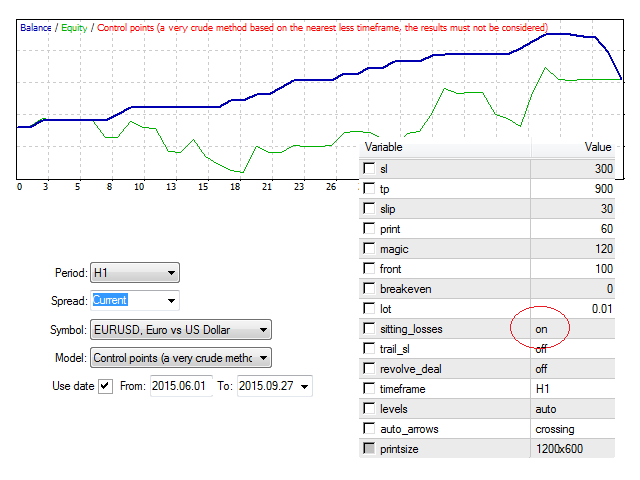 The trading mode (arrow type) is now logged in the line history, which is used for parameters optimization. 4. Line history is now logged to the common directory of trading terminals. 1. Upon request of one of the buyers, added the ability to change a traded timeframe (that affects the interval between a closed deal and checking the presence of a signal for opening a next deal). To do this, set the 'timeframe' parameter to the necessary value: M1, М5, М15, М30, Н1, Н4 or D1. You can also disable control over the current bar's Open price location between the 'front' line and the level (open_before_front parameter - on/off). 2. If you are used to waiting out your losses, you are free to do that now. Simply set 'back' and 'sl' parameters to similar values (for example, back=200, sl=200). When a deal is opened, a stop loss is not placed (only take profit). If the price crosses the 'back' line, a take profit is moved to the Open price by 'outsit*front' value, while the EA starts waiting for the next signal. Thus, several deals in both directions can be opened at a single symbol. 3. If you define support/resistance levels so late that the price usually manages to break them through by the time you do that (this often happens to me) rather than roll back, you should trade breakthroughs. This option is enabled by setting the 'tp' parameter to a negative value. You can also use here the method described in p. 2.